…and more random thoughts by CheriBLevy. 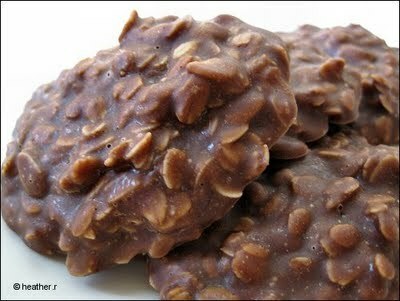 This, in the baking community, is called Gorilla Poop (cookies) or…No Bake Cookies. I am in a weird mood and even though it’s not Wednesday, I have to post about weird stuff today, which basically means, random train of thought blubbering. Enjoy! In my reader today there was a post from my “friend”, a blogger at Inspire & Indulge, and her title made me giggle, I am still even chuckling to myself…because THIS is what she posted. While I think the name is funny and a bit gross, I am DEFINITELY going to make these probably in the next 24 hours for a few reasons. You get it. I have mentioned before in previous posts about how I like to prank others. Nothing too dramatic, I am not super creative, just a bit so that I can get a good laugh. I feel a hidden camera or interview type style might be necessary to pull it off and be able to film their reactions. On other random news in my life. I watched this clip of Jimmy Fallon & Rashida Jones and I can’t stop smiling. They look like they are having so much fun. I love her in Parks & Rec and loved her in The Office, and okay – basically anything so it was a win win for me. In all due fairness, I equally love Jimmy Fallon. He makes me smile and laugh EVERY SINGLE TIME I SEE ANYTHING HE DOES! I know that’s the point and I can join probably the other millions of people in the world that feel the same way I do. Make time to laugh. Cause others to smile. Remember to share your feelings with those you love. So with that I thought to share some of the things that made me smile today even though they were unconnected and even a bit off-color. Perhaps they’ll make you smile as well. Wishing everyone a blessed day.